I first started hearing about Peace and Parsnips early in the year. I was on a recipe book buying ban, so I added it to my Birthday list (I got about 7 recipe books for my birthday this year) and waited and waited and waited til 30th March. I'd heard such good things about this book, and one of my all-time favourite food bloggers, Jack Monroe, claimed she "evangelised" about this book on Twitter. I was so, so, so excited for it to arrive. And when it did arrive, it's gorgeous. A huge hard-back tome I couldn't wait to get into. Did I secretly love this book but wanted to hate it? Did I hate this book and want to love it? I really, really, really wanted to love this book. In fact, I've given up on it, because I'm tired of spending upwards of 2 hours on a recipe, scouring the health food shop and Asian markets and the World Food Supermarket and still not being able to find ingredients, only to write in my notes "not worth the effort." My first impression of this book was good... but then quickly turned sour. Do you want to know how many photos of the author there are in this book? THERE ARE SIXTY TWO PHOTOS OF HIS FACE IN THIS BOOK. It's like an autobiography with a few recipes in. Every recipe has a 6-7 sentence paragraph about his travels. "Oh I eat this at my holiday home in Spain" "When I was visiting India" "I travel a lot in France" which just not my cup of tea at all. I know some people like that, but for me, I want the recipe, and some photos of the finished product, I don't want your life story. Then there are the recipes. Loads of them sound good, in fact there were at least 20 or so recipes that I was excited to try. But once you start reading the recipes, a few things become clear. There are lot of steps to these recipes - there's no way you'd manage them in an hour, and an hour is my maximum cooking time for after work. There are a lot of unusual ingredients - seriously, I live in Manchester city centre, round the corner from one of the biggest Chinatowns in Europe and there were some Asian ingredients I couldn't find. There's a lot of thinking ahead - soak the cashews for 4 hours, soak the raisins, let this sit in the fridge for 4 hours - and the recipes don't have a preparation time, so you can end up halfway through making something, starving hungry, only to find it needs another hour. And as a result of this, I personally think he makes veganism seem unnecessarily complicated. I have a lot of vegan books. At least a dozen. And I could live in Minimalist Baker or Aine Carlin or any of my Isa books. I'm used to cooking vegan. We eat vegan a few times a week. But this was making everything so ingredient-heavy and time-consuming and complicated. One recipe that declared "this is a quick recipe" took over 2 hours! So first impressions are... I already had a strong impression this book wasn't for me. It's a bit too "hippie vegan", too pretentious, very complicated, way too hyperbolic, and the way he writes is jarringly floral and over the top (I've written in my notes '"happy mouth tingle" - what are you on about?'). But I was determined to give it a go. I mean this is the book with Amazon reviews that say "potentially life-changing", and "best recipe book I own", and "if I had the money I'd buy this for everyone I know" and most shocking, "plenty for week day suppers." 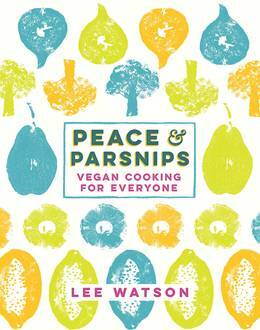 So here's my attempt at giving Peace and Parsnips a go (spoiler alert: it didn't go well). Well, it didn't get off to a good start. I didn't read the recipe properly and didn't see that my nuts had to be "soaked for at least 4 hours" as there are no guidelines on times, but luckily I spotted this in time and managed to get some soaking in, but I really didn't like that there is absolutely no indication of how long a recipe takes! Speaking of the nuts, the quantities were in "handfuls" which is far too vague for me (especially as I have really small hands!). But once I got going this was relatively easy - not labour-intensive but definitely time-intensive with soaking the nuts, cooking the aubergines and quite a few steps along the way. I loved the spice combination - coriander, cumin, mint, cinnamon and thyme - and when I tasted the mix of a spoon before cooking it was delicious! I didn't make the accompanying sauce (which was probably a mistake, as I'll explain later) but this was really, really delicious, I ever said I would happily eat this for Christmas dinner! It was wonderfully rich and filling and made plenty (which it a nice change from my other recipe books!). I'd had some filo pastry lurking in the freezer for absolutely ages so I thought this would be a good way to use it up. Again, there was no guideline on how long it would take to cook, and quite a bit of cooking knowledge was assumed, which was how I ended up burning my almonds (it didn't say how to roast almonds!). There was very little detail in some sections on how hot a pan had to be. I didn't have the right kind of pan, so my pastry went everywhere (admittedly, not his fault), and mine ended up tasty, but a bit dry. Not one I'd make again. I swear to you, I scoured the Asian markets for anchor powder, and if I can't get it in Manchester's Chinatown, I'd consider that a pretty hard to obtain ingredient. I had to buy silken tofu for this even though it only used a tiny amount, and I'm not a fan of the silken kind (I did turn it into a decent tofu scramble the next day, though). This took 1.5 hours in total, nearly every pan in my house and I didn't even like them. I can't pinpoint what it was I didn't like. They were too oily and too bland and flavourless. I didn't make my own mango chutney and I drew the line at frying my chips in 2.5cm of oil. I think as bhajis they might have been nice, but they didn't really work as burgers, at least not for me. Phil actually really enjoyed them, though. Past-Charlotte has just written here "took a really long time" and "not really worth the effort", and seeing as I made this a few months ago, I'm afraid I have no more information than that! Hmmm. So, the burgers themselves have 16 ingredients. SIXTEEN. Luckily I managed to get miso from Holland and Barrett and I live down the round from a Japanese supermarket for the seaweed, but this seemed excessive. The burgers called for pre-cooked rice, which I had to make, and I had to make a few substitutions - walnuts instead of pecans, cannelini beans instead of flagelot beans, panko instead of breadcrumbs. The prep alone took over an hour, and I had to process the mix in 3 batches - how big is his food processor?! I got 8 big burgers in total and they firmed up nicely in the fridge, but they still fell apart in the pan (as all veggie burgers tend to do!). These were actually pretty good - I'm really glad I made the alioli as they really made the dish - but I'm not sure I'd go to the effort to make them again. There was also a LOT of washing up for poor Phil due to lots of "put this to one side in a bowl." Tasty, but I've had better veggie burgers that haven't involved spending £3 on seaweed. I don't know why I always feel compelled to make chana masala seeing as I already have a recipe for it that I LOVE. This needed two hours of soaking, and that's not even using dried chickpeas, however after the soaking this came together quite quickly. Well, for him, at least. By "quite quickly" I mean, an hour. Huge portions and it was tasty enough, but I have other chana masala recipes that I prefer. Past-Charlotte has written "takes a while, duh", so I think by this point she was totally done with Peace and Parsnips and his sass. The rumbledethumps take an hour to firm up in the fridge, and you use this time to make the beans, which actually works out quite well, and the whole thing took about an hour and a half in total. I used a mix of brown sugar and water to substitute the molasses, and used butter beans instead of haricot. I nearly didn't bother with the mustard and walnut topping but I'm so so glad I did! As much as I criticise this book, he does have a way with sauces and toppings and accompaniments that really bring out the flavour of the dish. I really loved the beans and glad I made extra to have on toast through the week, and with the topping it's really tasty, but it doesn't look that impressive for all the work. It's basically over-complicated baked beans and mash. Would I make it again? Maybe the beans but I'm sure there are quicker ways of making them! I braved cooking this midweek as it seemed easy enough to throw together after work! The apricots needed 2 hours of soaking, so I threw them in with some water in the morning before my run and took them out before work, and that seemed to be enough. This was actually really delicious, but I had some chickpeas in the fridge so I made a quick houmous and wow, that makes it another level! I would definitely consider making this again as a bit of a mezze platter with houmous and pitta. Plus it makes loads and it's unexpectedly super filling. A success! So that's 10 recipes from Peace and Parsnips. I'd consider two of them to be enough of a success for me to make them again. I do have a list of another 5 or 6 recipes I was planning to make, in my desperate attempt to find the holy-grail recipe that redeems this book, but honestly, I'd rather spend my time and money making recipes that I know I will enjoy and won't take hours of my life but ultimately disappoint me. Maybe it's just me. This book has some absolute rave reviews from vegans and non-vegans alike, but for me, the narrative and photos rubbed me the complete wrong way from the start, and while the recipes inspired me, the final result was nearly always a let down, and never correlative to the amount of time involved. I thought this book made vegan cooking seem incredibly time-consuming, overly complicated and expensive, involved some ingredients I hadn't even heard of! If you're an adventurous cook who likes a challenge with plenty of time on your hands, maybe this is for you, but this book isn't for me. I've said before, I like recipes that I can easily make after work and where I can get most of the ingredients from Aldi. However, I'm sure I'll still turn to this from time to time to try to make those last few recipes I fancied, and who knows, maybe when I've got more time I'll give this another go, but right now, this was a fail, as much as I tried to justify it. If I'm going to spend hours in the kitchen, I want something absolutely mind-blowing to come out of it, and with the exception of the nut roast, I just didn't find that with this book.